I still don't understand why when the AVG wasn't "scrubbed from the sky" over many months in China, the same aircraft are going to get scrubbed from the skies over Hawaii. What's the difference? Also, how are you going to destroy literally hundreds of facilities at Pearl with one lousy attack of 125 aircraft? I've been stationed there. It's big. You'd need nuclear weapons. And this is to say nothing of the commercial facilities at Honolulu and the many army bases all over the island. Just curious ... how many of the Japanese aircraft were torpedo types, and how well were they trained and equipped for bombing missions? Remember, the first attack was very well rehearsed in Japan, and this additional attack the next day is going to have to be scripted to tired aircrews on the fly, so to speak. Bgile wrote: I still don't understand why when the AVG wasn't "scrubbed from the sky" over many months in China, the same aircraft are going to get scrubbed from the skies over Hawaii. What's the difference? 2) They are facing the creme of the IJN fighter force arguably the best in the world at that time. 4) I belive the AVG was hand picked at least to some extent. The pilots at PH weren't. 5) The AVG didn't face a battle with it's entire force outnumbered 2:1 in it's first combat. As I stated earlier I've worked the numbers and with 125 planes you don't even have a good chance of taking out all the fuel tanks even if that's all that's targeted. And there's no smoke and there's no opposition. Maybe if you make the atacks one at a time and evaluate the results before the next attack but ... There's a long thread (or two) on this over on the axis hitory board for those interested. The torpedo bombers also practiced level bombers from what I understand like US pilots at least later in the war. Indeed I don't believe any of the 2nd wave AC carried torpedos. That's one reason they aren't going to be sinking many more ships. IF they arem with torpedos it will be the deep water ones and if they don't find ships at sea those are wasted. Result will be the third wave is probably only going to carry bombs and they don't have anymore of the special ones for use against BBs either so no more Arizona's. Why would the fuel tanks in Pearl be difficult to destroy? Fuel is very flammable and if you see this photo the depots are big easy targets. Can they be destroyed with 20mm gun fire or bombs are required? I think that bunker fuel was not very flammable, and the fuel silos would probably require a bomb hit to destroy. I think the fires could be extinguished before it was all burned off and much of it recovered from behind the berms. There was also a lot of fuel in the wrecked battleships which could be recovered. They sure won't have much use for it. I also don't think all the tanks would be hit. You always miss some, as we did at Haiphong. You can be sure the rebuilt tanks wouldn't be so obvious, either. Remember you are also talking about destroying ALL the repair facilites, ALL the drydocks (the british failed multiple times to destroy one big one), ALL the warehouses, etc while being subject to heavy AA fire. And all this with one attack by 125 aircraft. Part of the difficulty in taking out all the tanks is just in the way statistics works. Say you have 20 tanks and a 50% chance of hitting. Most people would guess that 40 planes would be enough but If you assign say two planes to each tank then 25% of the tanks will survive. Even if you have 60 planes and asing 3 to each tank 12.5% wil survive (on average). 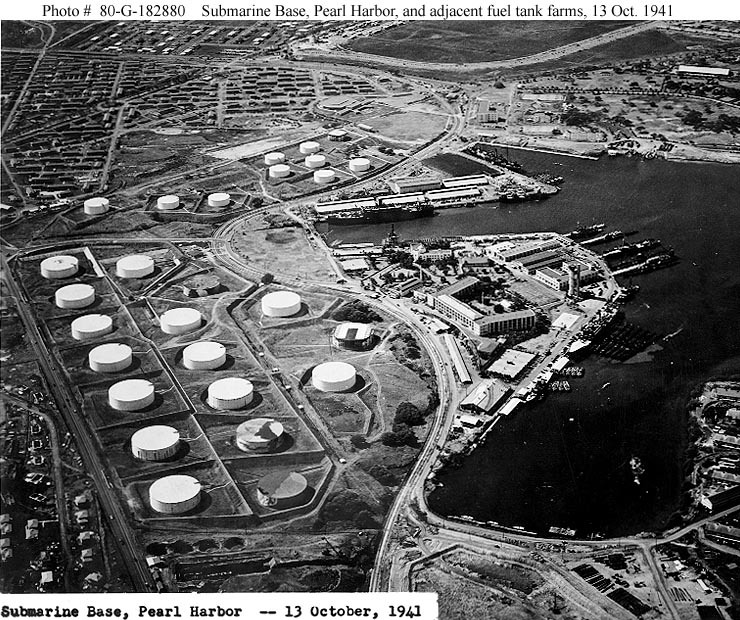 I think there were something like 50+ tanks at Pearl and the likely PH of the Japanese planes was going to be less than .r in a third wave attack. I believe the US alread had underground tanks uderconstruction. Not only hard to spot but difficult to take out even if you do know where they are. RF wrote: Given the stealth approach to north-west Hawaii over time and the relatively close proximity to the attack area would this have been a problem? In any event the presence of eight carriers would provide a substantial force for any counter-attack - if that were possible. 1) range. IF they can't make it from the refueling point back to another safe refueling point that's a major problem. 2) speed. The run in to PH was at high speed and operations are at high speed. If the carriiers can't keep up then the force ends up split u p.
I wasn't sure what carriers you were talking about so I looked around and found three that might fit the bill. Note all are small and Hosho is definitly slow. All 3 were involved in operations vs the Philipines and may have been judged to be of much more use there in any case. Zuiho and Ryujo were the two I was thinking of. Yes they are slower, but a more concentrated operation would have to be conducted at a slower pace, particulary as some have suggested the further air attacks be launched on the 8 December. To be honest if I was the IJN I would want a situation where before attacking the US I would want the war in China to be over and the East Indies and Malaya to be already occupied, without any prior US military intervention. My operation would be then to attack Pearl Harbor in three waves and then immediately follow up with an all out invasion of Hawaii, with a force at least 100,000 strong. This would be feasible if Japan was fighting the US only. Looking at the image above Minoru these tanks seem vulnerable to pattern bombing attack. To be honest if I was the IJN Iwould want a situation where before attacking the US I would want the war in China to be over and the East Indies and Malaya to be already occupied, without any prior US military intervention. The Japanese were unable to defeat China, so they decided it was best to go to war with several other countries as well. Tiornu wrote: The Japanese were unable to defeat China, so they decided it was best to go to war with several other countries as well. The military leaders lost the ability to distinguish the national interest from their own parties' political interest. The United States is in a similar situation today with its political parties. lwd wrote: Part of the difficulty in taking out all the tanks is just in the way statistics works. Say you have 20 tanks and a 50% chance of hitting. Most people would guess that 40 planes would be enough but If you assign say two planes to each tank then 25% of the tanks will survive. Even if you have 60 planes and asing 3 to each tank 12.5% wil survive (on average). I think there were something like 50+ tanks at Pearl and the likely PH of the Japanese planes was going to be less than .r in a third wave attack. I have counted 53 oil tanks at Pearl and I agree it would be almost impossible to destroy all of them. Some would survive but I disagree with your 50% chance of hitting. Have you noticed how big these tanks are? and the white color makes them very easy to spot. I say it is much easier to hit one of those oil tanks than a battleship. Now I don't know how much accurate the Japanese bombers were but it shouldn't be very difficult for them. A German Stuka won't miss. RF wrote: To be honest if I was the IJN I would want a situation where before attacking the US I would want the war in China to be over and the East Indies and Malaya to be already occupied, without any prior US military intervention. My operation would be then to attack Pearl Harbor in three waves and then immediately follow up with an all out invasion of Hawaii, with a force at least 100,000 strong. This would be feasible if Japan was fighting the US only. Landings in Hawaii were initially considered by the Japanese but the idea was finally rejected for lack of troopships and because the greater chance of such a large invasion force being detected. RF wrote: Looking at the image above Minoru these tanks seem vulnerable to pattern bombing attack. Yes, I think so. They are very close to each to other too. I wonder if they are vulnerable to 20mm gunfire. minoru genda wrote: .... Some would survive but I disagree with your 50% chance of hitting. It was example. In reality I doubt it would be that good. I don't believe the Japanese even got to 30% vs the mostly paired BBs at Pearl. And that's without much opposition, AA, or smoke in the first wave. Now I don't know how much accurate the Japanese bombers were but it shouldn't be very difficult for them. A German Stuka won't miss. Your faith in them is almost assuredly miss placed. I've seen nothing to indicate the Germans would have done better and much to indicate they wouldn't have done as well. Do you have any evidence to support your believe. Lwd, look at the size of the tanks. They are BIG! I estimate they are about 200 feet in diameter. Do you really think a dive bomber has less than 50% to hit such a big target?